Genre: FPS. Other versions: X360; PC. Given the popularity of the modern first-person shoot ‘em up and an increasing shift towards open-world games, it was perhaps inevitable that hybrids of the two would become commonplace in their own right. 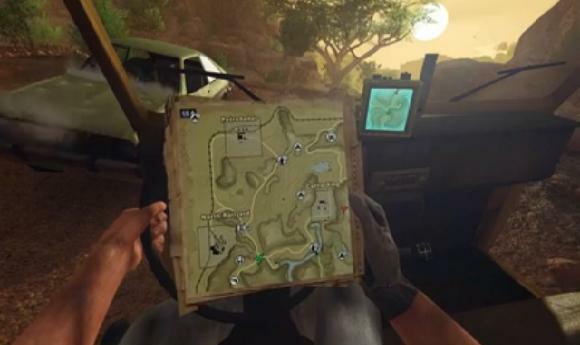 Whilst Far Cry 2 at times borders on excellence in the technical stakes, its selective adherence to realism often proves unpalatable as a gaming experience, especially as it tends to place emphasis more on the humdrum than the exciting. After picking from a bunch of mercenaries (a largely cosmetic choice), the player is promptly dumped into a lawless African state with the aim of killing The Jackal, an enigma selling weapons to warring gang factions. He's very good at making himself scarce, save for when he wishes to tease you with the moral ambiguity of the whole situation. It’s a lengthy game though, so you’ve plenty of time to admire the swamps, rivers and none-too-subtle nods to Apocalypse Now as you head for an off-limits area known as ‘Heart of Darkness’, still wondering whether or not you’re destined to kill Colonel Kurtz. Whoops, I mean: The Jackal. 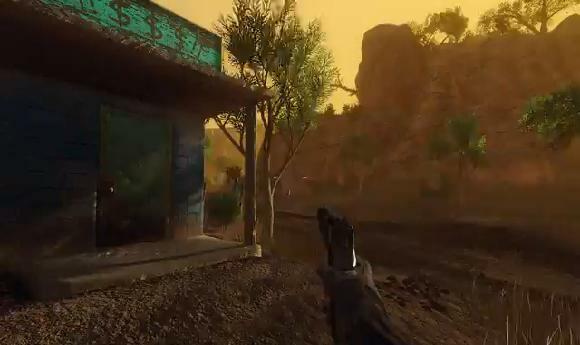 In fairness though, if there’s a single attribute by which you remember Far Cry 2 after the event, it’s likely to be a positive one; the enormity and incredible aesthetic beauty of the environment. You travel on foot, by car, or by boat and there are literally dozens of square-kilometres to explore with near-total freedom. The bright sand dunes and swirling wind effects are breathtakingly pretty; jungle canopies are lushly coloured and provide effective shadowing and cover, whilst sites such as a tribal village that stretches up into the hills and a suspension bridge that overlooks a vast river make for some genuine ‘wow’ moments. Though you’ll meet a myriad of people (99.9% of whom want to kill you) on your travels, it’s the environment itself that’s the real living entity. You’ll see the sun set, the moon rise and generally come to appreciate how the surroundings take on a different cadence depending on the time they are visited. You can see for massive distances if you scale high ground, and it’s all the more impressive when you consider the almost-complete absence of loading times or lag. "Now... Where's the nearest garage? Oh, bugger." 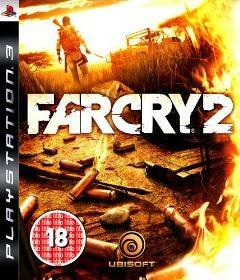 Unfortunately, Far Cry 2’s immense size proves a double-edged sword. The sublime architecture is sadly not matched by the rather less than visionary mission design, whilst the game’s deliberate inaccessibility makes life a hassle. Objectives tend not to stray from assassinations or stealing/blowing up something important, the commonality between them all is a heck of a lot of travelling. The bus service, which allows instant movement between five locations on the map, is put to irritatingly poor use. It doesn’t really alleviate much of the travelling, and these trips back and forth soon become laborious. There are times when you have to drive for several minutes in order to instigate a mission, only to then have to retrace the route having discovered that the designated target is several miles back the other away. And it isn’t just the primary missions; most of the optional ones are equally off-the-beaten-track, and it’s annoying that having completed a deed for a fellow mercenary, you then have to head all the way back to them to ‘end’ the mission. The idea of the bus service itself seems ludicrous in light of the fact you can barely travel 300 yards without being shot at, either at checkpoints that line every junction, or the numerous patrol sweeps. And should you find yourself in the middle of nowhere with your mode of transport destroyed or wedged irretrievably in the scenery, well, you’ll have even longer to ponder things. Novel authentic touches are often tainted by their overuse or needless prominence. Rust belies a weapon’s wear, though the sheer regularity that they jam whilst firing is utterly tedious. 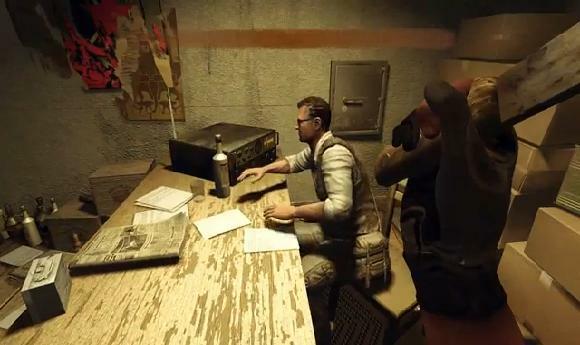 The developers also figured that as a foreigner in a generic African state, it’s a given that you must have Malaria; thus you can’t run for long without the need to seek out medication in order to stop bouts of blurred vision and shakes, which all feels a bit pointless really. Vehicles (which include Jeeps, cars and buggies) handle nicely and are generally good fun to drive on rough terrain, whilst little details like bullets in the windscreen and the Sat-Nav map are pleasing. Sadly, they aren’t especially fast and prove highly susceptible to damage from both gunfire and scenery, leaving you to pay frequent visits to the bonnet in order to alleviate some of the mounting damage. It’s all a little bit too much like hard work, which is a shame, as the gun fights are decent. Enemies are intelligent and the often-large numbers you’ll face make for some absorbing battles, with the need to identify and utilise cover becoming imperative, whilst skulking around buildings and perimeters proves tense when you’re not sure where the last few assailants are hiding. 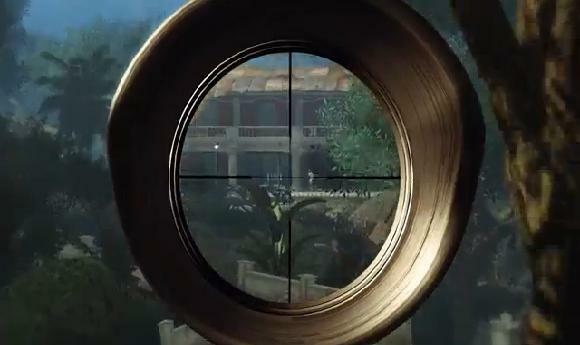 Weapons are smart as you’ll genuinely find it advantageous to think about which types to carry into specific missions. Sniper rifles are excellent in open areas, whilst flamethrowers can set the ground alight and cause fires to push back your foes, and thanks to some top quality destructible scenery, firing a rocket launcher into a building or explosive barrel never gets old. "Admit it, it was YOU who took my laptop, wasn't it?!" A little spice is added to the mix in the form of ‘friends’ (fellow mercenaries) joining in the fire-fights. You have to pay particular attention to them though, as in Far Cry 2 the death of a comrade is permanent. Exploring the surroundings is encouraged by an element of treasure hunting, as your electronic map blips when in the vicinity of one of the 200+ briefcases housing diamonds. Whilst the placement of some of them is a bit ridiculous, finding the diamonds is highly rewarding and satisfying, not least because you can trade your findings for upgrades. With all the extras and side-quests taken into account, it’s one of the lengthiest single-player FPS campaigns around, with the main story easily totting up 30 hours. An atmospheric prison escape scene in the latter stages is sadly squandered by the game’s lacklustre conclusion. It ends on an absolute cliché-fest of a finale; riddled with moralistic rhetoric that feels like the hollow imitation of cinematic licence, rather than a self-made gravitas that the ambitious setting so richly deserved. Online adds mileage, with Team Deathmatch proving the most enjoyable of the four setups. Though it doesn’t allow for as many players or as great a set of game variants as some, it’s still credible experience. A vast network of user-created maps helps, as even if they can be a bit hit and miss, they’re easy to access and free to download. 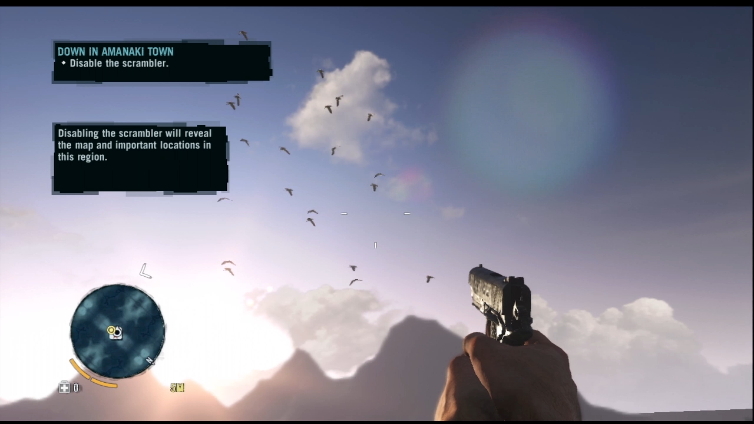 Ultimately if you like your shooting mixed with large-scale exploration, then there are plenty of reasons to recommend Far Cry 2. It will take awhile to complete, but whether you wish to see it through largely depends on how much time you have and how patient you are with the hundreds of kilometres worth of travelling that stands between you and the credits. On a technical level it’s a marvel and as a shoot ‘em up it is very good, but for many, the overriding sense of ‘are we there yet?’ will not feel like time well spent.